For too long gamers, streamers and online content creators have had to handle multiple software solutions for streaming, screen capturing and video editing. Not anymore! 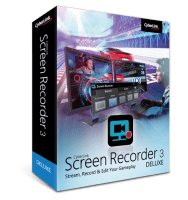 CyberLink Screen Recorder 3 couples the easy-to- use editing features of PowerDirector – The No.1 Choice for Video Editors – with responsive, high-quality screen casting and capturing technology. It is the only all-in- one solution for recording or streaming gameplay, vlogging, or sharing screen content with an online audience.